Constraints can conduce creativity. That’s part of the fun of crafting a 140-character message, in my opinion. It’s like a haiku. Within its limitations can come great beauty. To me, this means more than describing what I had for lunch or how I had a bad day. Something beyond pointless babble, basically. Something hopefully useful, meaningful, and can provide someone with value. Perhaps an insightful quote (I have a thing for great quotes). Perhaps an interesting link. Or perhaps a business idea. Without that conversational context, I’ve purported to make replies useful as well. To me, this means trying to avoid empty responses like, “Thanks!”, “LOL”, or “:)”, and trying to provide some kind of context if I reply to someone. This isn’t always possible. When it’s not, I try to craft my reply so if readers click on the “in reply to…” link, they’ll be able to catch up quickly. It’s already tough to squeeze a useful message in 140 characters. Doing all of this on top of that is even more difficult. But I like to think that these constraints encourage me to think creatively. And hopefully, all of this makes my tweets more useful to my followers. P.S. I should mention another constraint. I try to keep my tweets at 126 characters, not 140. This gives room for a potential retweet. If someone were to retweet me, they would likely add a: “RT @mikeleeorg”. That’s 14 characters. Subtract that from 140, and the space I have left is 126 characters. Ah, the fun of constraints! When I look at an Apple (AAPL) product, I just want to say, “How you doin’?“ That’s because Apple makes some damn fine-looking products. Last week, I stated my theory as to why this is: Apple prioritizes product design over all else. When compromises in features or manufacturing cost need to be made, they uphold the beauty of the design first and foremost. However, I don’t think this will last. Their paramount emphasis on design comes from having an influential and high-ranking design champion: Steve Jobs. If a product VP dares suggest a design alteration to lower the cost for consumers, Jobs would probably lash back. He’s already known to be a critical micro-manager, so I don’t think this is a stretch. What this means is the DNA of Jobs is closely interwoven into Apple’s products. So close that building an Apple product without him might be impossible. When Jobs departs, I don’t think Apple will continue creating such elegant and visionary products anymore. And no, I don’t think any of his possible successors can do the job. If you’re involved in building and managing a company… think less in terms of being a brilliant product visionary or seeking the personality characteristics of charismatic leadership, and to think more in terms of being an organizational visionary and building the characteristics of a visionary company. I could be wrong, but I don’t think this has been Jobs’ focus. Apple’s product design process is intrinsically tied to Jobs. Without him relentlessly prioritizing design above all else, the company won’t be the same. I am the furthest thing from a Mac Fanboy, but even I gotta admit: Apple (AAPL) has some damn fine-looking products. Could it be Apple’s product designers? Are they just that phenomenal? Could be, but other companies have great product designers too. I’ve known and worked with many. Apple doesn’t corner the market on phenomenal product designers. My theory is that it lies in their design process. At the start of the design process, the product designers brainstorm and come up with various incarnations. They are shown to Jobs for approval. He selects one and the feedback is incorporated. Once it’s signed off, the chosen design more or less remains the same. If a feature or manufacturing cost threatens to change the design, the team compromises on the feature or cost (i.e. they remove the feature or make the product more expensive). The design is never compromised. This is why the end result is so beautiful. Most of the steps are similar to Apple’s. They brainstorm, create, approve, select, incorporate, and sign off. The difference comes when compromises need to be made. If a feature or manufacturing cost threatens to change the design, sometimes the feature wins, sometimes the manufacturing cost wins, and sometimes the design wins. Every company differs slightly in the way they weigh their priorities. Those priorities are reflected in the end result, which is sometimes beautiful and sometimes a horrible mess. That, in a nutshell, is why I think Apple’s products look so good and other companies’ products don’t. Apple prioritizes product design above all else. Can this be replicated at other companies? Sure. Some companies already do, though perhaps not to the extent that Apple does. I’m guessing this is because of Jobs. His unrelenting push for elegant design is legendary, as is his vehement criticism of poor design. Without such a influential and high-ranking champion of design in the company, however, it might be difficult to replicate. Here’s a neat visual of most (maybe all?) the apps that, in some way, aid your usage & experience of Twitter. 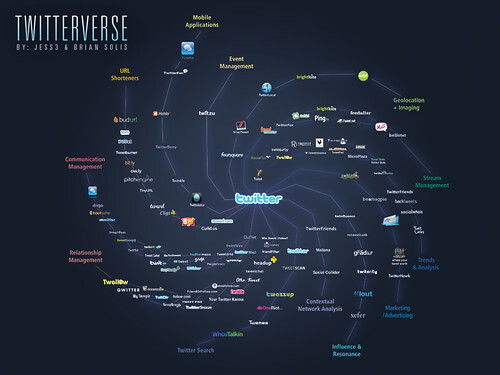 The Twitterverse, as authors Jesse Thomas & Brian Solis call it. This is just version 0.9. They’re still working on the final version. It’s a tough job for sure. I tried to visit a bunch of the apps listed in this chart and a few did not seem to exist anymore. And new ones seem to be cropping up every day. Makes me kind of wonder how this chart could look as a living, breathing animation that is constantly updated – and perhaps done in AJAX or Flash. Now there’s a fun project if you have some time on your hands. You could even extrapolate it into charts for other ecosystems, so to speak. Like Twitter celebrities, or popular blogs, or start-ups within a certain industry, etc. Great work by Jesse and Brian though! I’m eager to see the final version. I’m salivating right now. Could be because someone’s eating a plate of French fries next to me. Or could be because Amazon (AMZN) just released the new Kindle 2. Either way, both are equally scrumptious. I am in talks with my publisher Harvard Business School Press to create a Kindle version of my book. The main challenge is over the rights issue. Depending on what rights you have negotiated, authors and publishers may need to renegotiate permissions to receive rights to publish certain photos and text for the digital world. So here’s the deal. Thanks to Amazon and the Kindle, e-books have gone from the “can afford to ignore” category to the “I am looking into it” category, and now are entering “I have to have it” bucket. I think this should be good for readers and the publishing industry as a whole because it represents another outlet and market. But the transition may be a little bumpy as business models could be disrupted, and publishers become concerned that they are getting dis-intermediated out of their core business by technology companies. His thoughts echo what many others have said, making for an interesting debate. Ultimately, it will have to be the readers who decide if e-book devices are worth having. So far, I think there’s a definite niche market here. I’m craving one and lots of people already love it. That doesn’t mean there’s a mass market for e-books though; it just means there’s a niche for them. Personally, I still think this device will be a success – provided that Bezos and team can properly market this. And I’m rootin’ for them! Kyle Webster, an illustrator from North Carolina, put together this wacky video. Funny stuff! A pretty good job of self promotion through social media marketing too. Not a bad idea if you’re trying to make a name for yourself. Charles Lewis also did it through the Poetic Prophet viral video he made.